Gelal Research Group (GRG) has ranked Top 10 Business School for MBA.MBA program has been ranked in terms of job placement, rigor of curriculum, internship and research opportunities, student selectivity, and reputation of affiliated university. 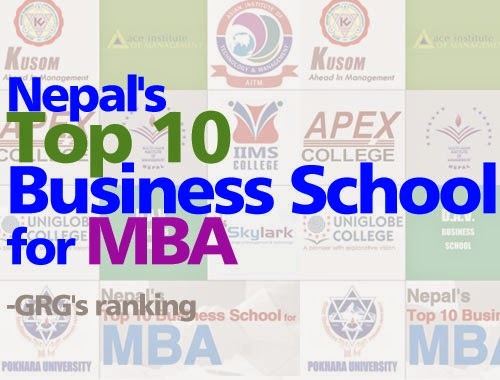 Established in August 1993 as a premier management development institute under Kathmandu University, KUSOM pioneered high quality and market responsive Graduate Management programs (MBA and EMBA) that are widely recognized as a passport to successful professional management career. It has produced over 650 high quality management graduates who are managing leading organizations across all sectors - with passion and professionalism. Ace Institute of Management is a contemporary, open-minded, conscientious learning centre where students rediscover themselves and learn to be thoughtful and responsible managers and leaders. In our 14 year history, since our inception in 1999, we have established ourselves as a leading institution that is living its vision of enhancing capacity of individuals and institutions in Nepal to contribute to the nation’s development. The Asian Institute of Technology & Management (AITM) was registered on 20 June 2012 to offer high-quality national and international programs in Nepal. Managed by experienced educationists and professionals, with more than three decades of proven track record and with both national and international experience, AITM wishes to be a positive agent of change, within the country, regionally and internationally, by collaborating with AIT in Thailand, IMI University Center in Switzerland, and other internationally reputed academic institutions so as to draw upon their vast experience and track record in operating in multi-national and multi-cultural academic settings. In offering international programs in Nepal, the main aim will be to transform Nepalese institutions of higher education into outstanding seats of learning, equipped to foster high-quality education, scholarship and research, to produce enlightened citizens with strong moral and ethical values. APEX College, established in 2000 and affiliated to Pokhara University, is a modern dynamic institution that blends rigorous academic pursuits with highly relevant, focused and skill-based courses to suit to the demand of various stakeholders in the job market. Quality education with student-centered teaching-learning approach, outstanding facilities, ample cocurricular activities, job placement and other academic services are the hallmarks of Apex's educational philosophy. These have been managed and supported by a strong IT backbone. Students experience remarkable self-motivation while working in the system. IIMS (Institute of International Management Science) is the only academic institution affiliated to LPU in Nepal. It offers degree programs both at the undergraduate and post graduate levels seeking to build and nurture graduates equipped with strong academic skills and expertise in general management, finance, accountancy, information technology and other related disciplines. A vast range of cultural, educational, athletic and social activities are available to students of IIMS. Uniglobe College, in affiliation with Pokhara University, runs Bachelor of Business Administration (BBA) , Bachelor of Business Administration – Banking and Insurance (BBA- BI) and Master of Business Administration (MBA) programs. The promoting team of Uniglobe College consists of academicians, researchers, entrepreneurs and professionals who enjoy considerable reputation both at home and abroad. The college management team has a proven track record in their academic excellence. The DAV Business School is premier educational institution. At our foundation is the pursuit of intellectual capital with impact. Our deep cmmitment to MBA professional education intense action-base learning drive our one-on-one learnign approach. Skylark College of Management and Technology was established with the primary objective of providing world-class management and IT education to budding professionals with higher career aspirations and to create leaders for the 21st Century. The academic, professional practice and performance standards of the Institute match the world-class colleges because we are affiliated to the University of Madras accredited ‘A’ grade by NAAC and title earned as ‘University with Potential for Excellence by UGC’. At , you find academic rigor, an exciting range of courses, bright classmates, competent faculty, supportive staff and an environment that encourages you to explore yourself to identify your chief potentials and meet the challenges. students are being imparted management and technical education in a very cohesive, disciplined and professional environment. The Institute strives to leave no stone unturned today to make our students trend-setting professionals of tomorrow. Pokhara University School of Business is an institution rich in resources. The School of Business (SOB) is the constituent Business School of Pokhara University, located at Dhungepatan, Lekhnath, 13 km east of Pokhara. It was established in 1999 under the Faculty of Management Studies (FMS). Its vision is to develop into a premier business school in order to prepare the youth of today for in creative and productive ways the growing challenges of the business world, both locally and internationally.